Everything you need to know about Thrifty car rental New Zealand. Thrifty by name means Thrifty by nature. There are many reasons why people choose to hire their rental cars through Thrifty car rental. Each rental car is checked and maintained by trained Thrifty mechanics. There is an extensive network of car hire depots throughout the country which makes for flexibility in travel arrangements and allows a greater possibility for one- way travel. But the real winner is the price. Thrifty car rental offers unbeatable value, and this, combined Thrifty Car Rental Vehicle - VroomVroomVroom with the services they offer and options that are available, make Thrifty an obvious choice when it comes to car rental. The prices get even better for you when you book your Thrifty rental car through VroomVroomVroom. Thrifty hire cars booked through VroomVroomVroom get a 5% discount automatically calculated into the quote (although the discount may not be offered on already discounted deals). While you're on the VroomVroomVroom website why not check out all the other deals and specials offered by New Zealand's most respected car hire companies? To make sure you're getting the best deal possible visit VroomVroomVroom to compare Thrifty's prices and deals with the rest of New Zealand's most popular rental car companies. It pays to make sure you've got the best deal with the right options for your car rental experience, so it would be crazy if you didn't take advantage of the chance to shop around in the one convenient place. Best of all you can search all the rental car deals by location. Thrifty is a car rental brand name you can trust, and you can get a great deal on a Thrifty rental car by booking through VroomVroomVroom. Our official agreement with Thrifty provides great new deals on a daily basis. 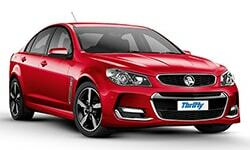 Visit VroomVroomVroom now to see what unbelievable Thrifty specials are on offer right now. Thrifty New Zealand was recently awarded Gold status from Qualmark, which is an independent authority on the quality of tourism businesses and endorses the quality of the experience customers will receive. Qualmark is owned by Tourism New Zealand.